My wife and I recently bought a new dishwasher. We'd been seriously considering buying a dishwasher for a few months. My wife has wanted one for a couple years. Our old dishwasher was about 12 years old and it was a very cheap model when it was purchased. The worst thing about it is that it was very loud. The noise was extremely annoying. Plus it didn't clean the dishes well consistently. The purchase was not totally planned but not quite made on a whim. Originally we were going to go to Sears just to research what they had available. We'd already looked at Home Depot and Lowes. I had also compared Sears prices and selection to Home Depot, Lowes and another local store online. We had a good idea what was out there as far as prices and selection. When we got to Sears they had a lot more selection that we saw at the home improvement stores and the prices were pretty competitive too. Plus Sears happened to be having a sale. I don't think thats anything unusual, as it seems that Sears is often having a sale on appliances and if they aren't then its only a matter of a few weeks before another sale event hits. 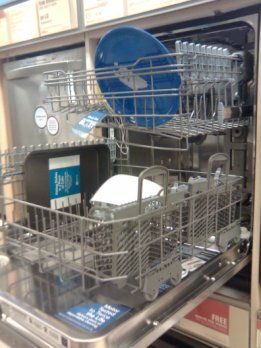 We found a Maytag dishwasher with the features we wanted that was about 30% off the retail price. Maytag is a pretty good brand as well from what I'd read. We had previously considered an LG model at Home Depot that was a little more expensive. However after we'd looked at the LG in the store I'd read online that LG didn't always do as well in the product reviews and reliability ratings. The Maytag model had the features that we were looking for and a fairly good price compared to what we'd seen for models offering the design style and options we wanted. We decided to go ahead and buy the dishwasher. We hadn't gone to Sears that day with the mindset to buy. So the purchase decision was not as planned out and methodically researched as ideal. If I had to do it again I would have at least done a quick internet search to make sure we couldn't get the same Maytag model for cheaper elsewhere and verify that it didn't have a lot of bad reviews. After the fact I did do such a search online for the model in question and found that the price we paid was fairly competitive and the consumer reviews for that model were quite positive. So in hindsight it looks like we did in fact make a good purchase. When we went to buy the dishwasher the salesman pitched us the Sears credit card and the 10% savings as salespeople typically do at the time of checkout. Usually I brush off these offers since I really don't need more credit cards and 10% savings isn't usually enough to entice me. However this time the 10% came with an extra $15 off and would add up to close about $100 in our case. On top of that I had a Sears card in the past but it was canceled simply because I didn't use it. I figured saving about $100 was worth getting the card. We will pay off the entire purchase when we get the next statement. If we weren't able to pay off the purchase then we wouldn't even be buying it in the first place. So I"m not paying any finance charges and I also made sure the card doesn't have any kind of annual fee. With the sale and credit card discount we paid about $750 for the dishwasher including delivery and installation. The installation and delivery charge was around $140. We could have saved some money by picking it up and installing it myself. However I don't own a truck so I'd either have to rent one or hassle a friend to do me a favor. I also haven't installed a dishwasher before so I'd have to figure out how to do it and could screw something up. But the key reason we chose to pay extra for delivery and installation was for convenience. The price range on dishwashwers is anything from $200 up to $1,500 not including delivery and installation. The very cheap $200-$300 price range is really no better than the basic model we already have. We were satisfied paying the amount we did to get the features we wanted. The expense was not a 'need'. We wanted a new dishwasher, but we did not need one. I think that it is important to recognize and be honest with yourself about when you're buying something you 'need' versus when you're buying something that you simply 'want'. I was actually pretty impressed with the wide selection they had at Sears and the job the sales person did. Sears had more selection than Home Depot or Lowes. The sales people at Home Depot and Lowes were not quite as knowledgeable or attentive as the sales staff at Sears. And the prices at Sears were pretty competitive as well. The one local chain I know of that sells a lot of appliances doesn't have as competitive prices. A day or two after we made the purchase I got a call form Sears saying delivery was delayed. The delivery and installation won't happen for about four weeks. We weren't in any huge rush to get the new dishwasher but it is honestly a bit annoying to have to wait that long.